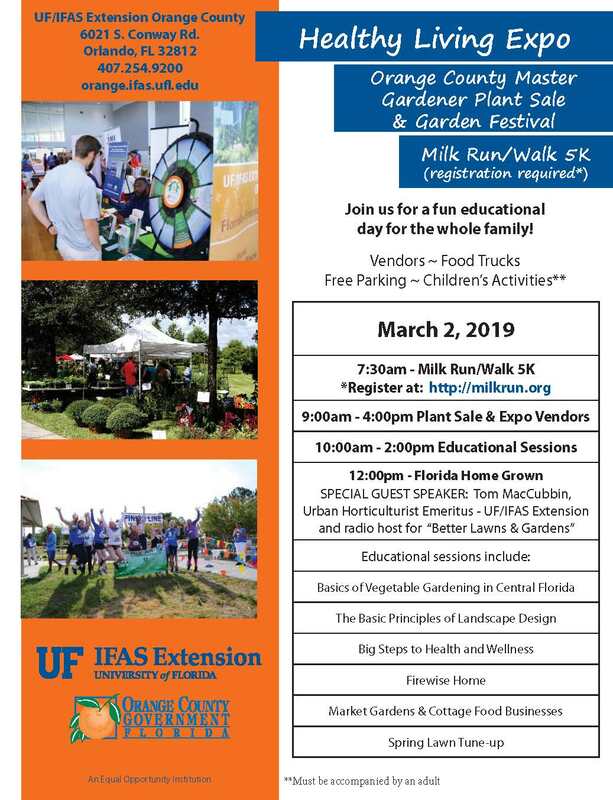 Join us on March 2, 2019 for our Healthy Living Expo, 5k Milk Run and Orange County Master Gardener Plant Sale & Garden Festival at UF/IFAS Extension Orange County. Start your day off right by running through historic dairy cow pastures while enjoying all the beauty Florida nature has to offer. Afterward, visit the many vendors at the Master Gardener Plant Sale & Garden Festival, along with the many health and wellness vendors at the Healthy Living Expo. In addition to our special guest speaker, Tom MacCubbin, UF/IFAS Extension Agents will offer a variety of classes though out the day. There will also be a KIDZONE, offering fun and educational activities for children, accompanied by an adult. Come get your HEALTHY on!